Will Edible Dirt Make You Clean Your Plate? Forget foam. A new crop of innovative chefs is serving up edible "dirt"
Copenhagen's Noma, the reigning best restaurant in the world, according to the prestigious Restaurant magazine, has been dazzling diners since it opened in 2003 with unorthodox ingredients such as just-picked flowers and wild game. But the most intriguing item on the menu by far? 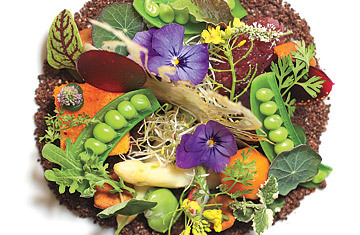 Chef René Redzepi's edible "dirt." Edible dirt--perhaps one of the strangest fads to hit haute cuisine since sous vide--is not actual dirt but rather dried or charred ingredients used to give menu items an extra-earthy kick. Redzepi, 32, makes his dirt from dried malt and beer and presents it in terra cotta pots, "planted" with a whole raw radish to accompany a seven-course tasting menu. Redzepi may be the most celebrated proponent of edible dirt, but he's not the only one. Although edible dirts vary in consistency (some resemble ash, others sand or soil), they typically serve the same culinary function: to anchor their dish's vegetables and proteins. At Tel Aviv's Shakuf, Eldad Shem-Tov serves dirt crafted from chickpeas and topped with smoked quail eggs. At San Francisco's Marlowe, Jennifer Puccio's dried-olive soil comes with pickled radishes and whipped chèvre. Both mushroom soil and charred-onion ash can be found at Gilt in Manhattan; the former is part of a summer salad, the latter dusted onto Niman Ranch strip loin. And a dish of 30 seasonal vegetables served with dirt made from potato, parsnip and roasted chicory is on the menu at Manresa in Los Gatos, Calif. It was foams, gels and liquids that defined the last crop of superchefs, molecular gastronomists like Ferran Adrià, whose El Bulli in Spain is a five-time holder of the title of world's best restaurant. Redzepi and company are trading those elements for a more grounded geogastronomy--celebrating the land directly on the plate. "These chefs are reminding people where food actually comes from," says Nathan Garnett, the awards director at Restaurant. Still, edible dirt's real test isn't professional admiration but diner appreciation. "People are really wowed to see dirt on their plates," says Gilt's Justin Bogle, who is experimenting with "pebbles" made from frozen foie gras. "They're unsure at first, but then they realize it really tastes good." This article originally appeared in the September 27, 2010 issue of Time magazine.